At the start of Battle Born some players are struggling with problems and error messages, which prevent a smooth start the hero-shooter. For some problems, there are easy solutions and workarounds while for other issues you have to wait on the release of a fix or patch. In this guide, we list the most common causes of errors and give you, if applicable, solutions. To rule out some errors from the outset take a look at the official system requirements to Battle Born, to see if your PC meets the minimum or recommended system requirements. For some players it is propagated after the game start to crash, resulting in damage to their saved game with Error Message CE-34878-0. Solution: A fix does not yet exist for this issue. But at least you can create a backup of your gameplay prior to the end of the prologue. So you don’t have to repeat all over again. Generally it makes sense to create backups at regular intervals. Even the matchmaking makes sometimes problems. Here we can only give the advice to be patient, because the saver maybe overloaded at the start. Therefore, wait until the first rush has subsided and try again later. Some console players can not access additional game content, after they have finished a prologue. Solution: Check the download folder to see if you have already downloaded all the files from Battle Born. The game is downloaded in several steps. This has the advantage that you can play the tutorial using the base data. But for the rest you have to wait until the download is completed. This is another issue associated with the server. Solution: The servers are currently overloaded with the Games Edge Rank. Here you can try to close the game and start after a short while. Otherwise you have to wait until Gearbox provides more servers or the first rush has subsided. Aother problem that has to do with the overloaded servers. Solution: Again, patience is a virtue. Gearbox has probably underestimated the initial rush and you have to wait until the first set of players passes. 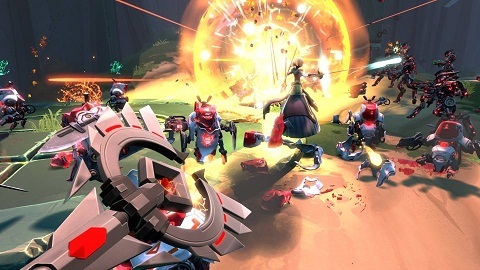 Some players have encountered errors and bugs while playing in co-op of Battle Born. As a character makes no noise when it moves or shoots and other complain that no voices are heard. In addition, text overlays are much too small to be able to read. Solution: There is no fix or workaround for this problem yet. You must wait until Gearbox take on the problem. Also playing in co-op Bugs have already occurred: As a character makes no noise when it moves or shoots and other complain that no voices are heard. In addition, any text overlays are much too small to be able to read it.